The Eternity is verified, and this is essentially the same but with a couple of part value changes and symmetrical clipping so it should be good to go. Post a front and back pic and I'll see if I can see anything. Hi, I just bought this kit and it's my first ever attempt at anything like this, so I'm having to learn as I go. The instructions that come or rather don't come with the kit are difficult to understand for a novice like me. I've managed to suss out the most part of it, but the bit that's confused me are the connections to the pots, power supply, input jack and output. 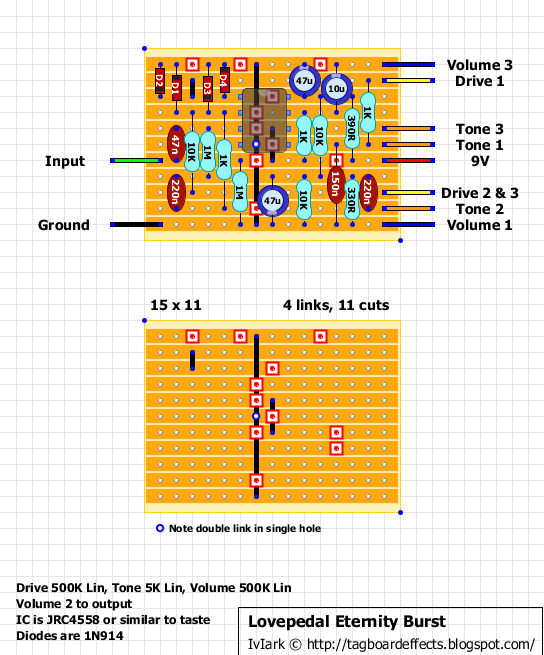 The drawing uses terms such as drive 1 and drive 2&3, Tone 1,2 & 3 + volume, which inplies 4 pots, yet I only got 3 pots with my kit.Also where does the on/0ff switch come into it? It's all a bit confusing ! Any chance someone could post a more detailed drawing please? The wiring of the stomp switch to the board input and outputs is also shown at the top of that page. The tone and gain pots need flipping as they work in reverse as is. This is nice pedal.. Surprised as to how much gain there is. Is it possible to burn out a pot? while switch my tone wires, one was stuck and I think too much heat was applied as my tone sounds a little dull now? Seriously? I originally had them that way and satrianidis on the non-Burst Eternity layout told me to swap them round so I did it for these too! I'm doubting myself now.. I'd leave it Mark just in case. As my luck with building at the moment, I wouldn't be surprised if I wired them backwards! Just made this one and it sounds SOOOO good !! So how do the pots need to be wired now? Build one last night and works a treat, great overdrive. Didn't have any 330Rs so went for 2 390Rs, no problem at all as you could imagine. I Build today but dont work. Any idea? Yes, you built it wrong. The layout is very much confirmed so you need to go over what you've done to find the error. If you post a front and back pic then we may spot something misplaced. Just I found the error in my bulit. Now work fine. Only two things. 1. It has many gain and hum with gain knob up 2. It have IC MC 4558CN. It is good ? Or maybe JRC 4558D? Hi, brother. can you fix the problem of gain and hum with gain knob? is the same error in my pedal. I just finished building this. The output volume seems to be much lower than in bypass even when fully cranked. I've double checked all the component values and reflowed everything, and I even swapped out the IC. Do you have any thoughts as to the cause? The pot controls all seem to work as it should, but the output is really low. Thanks. Hey there - thoughts anyone? Any help would be appreciated. I could be anything based on that description, bad solder joint on a board or pot, misplaced or incorrect value component, unwanted short. Literally there are so many things it could be. The one thing we know 100% is that if the build was correct then this layout would work, so you're going to have to go through what you have done. Check all cuts, components going to the correct rows, look for shorts across the tracks or maybe even in the cuts, and if you are 100% sure that absolutely everything is completely correct then the only other cause can be a faulty component(s) which will then need to be identified by replacing them in turn. 95% of the time in these instances there is a fault with the build and that is by far the most likely reason here, and when an effect isn't as loud as it should be that fault is usually a bad joint. But if you can measure the IC voltages then that may at least give us a clue to point you in the direction of the board that is most likely to be responsible. Thanks, Mark. I thought it was because I didn't have a 150n cap, so I used a 100n and 47n in a series, but I got more 150n's in stock and changing it out didn't work. I double checked all values, reflowed all joints, and recut all the tracks. Still work but at a low volume. I am counting the pins down on the left side and back up on the right side to match how it reads in data sheet. Hopefully that's correct. I could just build another one, but I need to learn how to better trouble shoot these things. I build the Eternity and that one worked just fine! Thanks in advance for any help! Just a quick note, capacitors are the opposite to resistors; if you want to add capacitors to make a higher value then place them in parallel! I built a completely new circuit again last night, and the new one only works when I lay my finger across a certain part of the back of the board (solder side). This one seems to be plagues for me. I built the Eternity with no problems though and it fired up right away!! Thanks for your help. I built my 3rd Burst hoping that the 3rd time would be a charm. This time, I get no signal when engaged, but when I engage the Skreddy Mayo which sits right after it in the chain, I get a signal!!! I have no idea what is going on and why I can't seem to get this to work... Do you think I got a bad batch of components that's shared across all? Sorry, so the third build has the exact same problem as the first. All the controls work but at low volume. You can hear the overdrive working but at a very low volume. I've swapped out the chip 3-4 times with the same result. So I'm a dork and accidentally ordered a 15uF instead of a 0.15uF cap for the 150nF... I have a bunch of .10, would those work there? or should I order up another .15? If you change that to 100n it increases the corner frequency of the low pass filter so it would let more highs through. You can do it of course, but if you want the filter to behave exactly the same then increase the 1K resistor also at pin 5 to 1.5K as well, and that gives you exactly the same frequency cutoff. Mark, you are awesome, as always. Thanks for the info. So, some further details-- I'm getting the buzz when plugged into my tele, but not in my gretsch that has filtertrons, but my tele doesn't buzz at all with any of my other dirt pedals (fulltone fulldrive, DLS mkIII) anyone have any thoughts? I built the Eternity and I can't make working. I post some photos, can you see them and help me? Some stupid question: is the board shown with the metalstrips up or are they on the other side of the drawing? Meaning which side is the soldering? Not a stupid question. What you are seeing is the component side of the board, the copper is underneath (keep this in mind when making your cuts, everything is inverted). Hi, I built this yesterday from the kit, but it's not making sound. The IC voltages are all around 8, higher rather than lower, and I can't see any problems with the actual vero - no shorting or cold joints - but I suspect possibly a grounding issue, as I accidentally created a grounding loop which I missed until my first test. Any suggestions as to what I should test next, where the problem might be, etc? They seem a bit high to me, but I've never used an IC before. Pin 4 must 0 volts. Pin 8 must be around 8V and rest around 4 volts. You have something horribly wrong with grounds. Seems like the ground gets the supply voltage too. Thank you so much for the reply! Unfortunately, no matter how much I go over it, I cannot see any deviation from the diagram. The ground wire goes from dc input to volume 3 to input socket, and the LED and vero go to the output socket. +ve lead goes to 9v input on the vero and through the switch to the LED. Have I done something wrong there? Could it be possible that I damaged a component by creating the ground loop? Those voltages won't happen by broken component. Are you sure about the dc jack's pins? You're still getting the supply voltage where you should be having ground. It's definitely outboard wiring issue. You are, embarrassingly for me, exactly right. I managed to get the positive and negative the wrong way around from the dc input - it appears to work perfectly now (semi tested - it's too late to properly test). Thanks so much for your help, this is my second ever build. Bit of a complete noob here, knocked up one of these on my breadboard and it was working really well, added in a jfet blender to the circuit, but managed to transpose my digits and used a 2N5485 instead of the 2N5458, now after 2 seconds of power i get an definite oscillation on the output and my led pulses, I can hear the overdrive underneath this, though it sounds more like a fuzz now. Is it safe to assume I have managed to pop the ic, by using the wrong jfet to drive it? Not sure what I should test to see, the voltage seems to pulse along with the oscillation as the led pulses too. This is running on a 9v battery so my power source in theory should be stable. Hi I want to buiild an overdrive for my chum who playsbass. Try increasing the input cap value. Hi, I have built the smaller version of this pedal but it is not working correctly. I am not getting any sound out of the output. I built an audio probe and the audio will work up until pin 3 of the IC chip. Voltages of the IC seem correct. 0 volts at 4 and the rest are between 3 and 5 volts except pin 3 which is less than one volt. Any ideas? This is my first pedal to build. If I use a resistance reading, I get a value from the input to the output. I also get the same value from the input to ground. Not sure if this is a problem. Here are pictures of my board. I built the 17x11 version and have the same issue. I also have the same voltages going to the IC pins. Is it possible I am using the incorrect IC chips, etc? Thank you for your quick response. I verified it was a 1M resistor and I reflowed the solder; still get the same value. I checked the 10K resistor before that (from before pin 8 to the 1M resistor) and am getting .3volts. If I check the resistance with power, its around 4k and without its around 8k. Is this something to be concerned about? Well it already has a pulldown resistor on the input and the volume pot acts as one on the output, so that points to something else. You can get popping from the LED so I'd disconnect that to check if that is the source of the noise. If not some switches have been known to cause popping, or you may have a dodgy capacitor somewhere and so it may be a case of swapping them until you find the culprit. Thanks Ivlark I gonna check this If the problem is the led is there something I can do to have a led and avoid popping? Any chance that the output pulldown might not be high enough? You could try sticking a 1m between signal and ground at the output, see if it makes a difference. Thanks Dave!!! I gonna try it. I already have an 1M resistor you mean to sold another one 1M between input and ground? No, i mean solder a 1M resistor between output and ground. I don't know for sure if it'll work or not so don't get your hopes up too much. If it doesn't work, try disconnecting the LED and see if it still happens, that way we can identify if it is actually the led causing problems. hello again i actually disconnect the led, i try it on my vox ac15c1 and its ok but afterwards i try it on a mesa boogie lonestar... at this time i was afraid that i was about to burn my friends amp a very loud click sound came out every time i push the footswitch... any idea??? If i try connecting a res 1M between ground and volume 2 gonna help??? ok i made it with the annoying sound but i would like to lower a little bit (at 40% ) the output signal. When i engaged the pedal it cames about a 50% louder than my other pedals, i can manage this from the volume pot moving it ccw but it changes the amount a gain also. So i would like to do something to lower the whole output signal i though of an resistor at the output jack but i am not really sure... PLEASE any advise? Now I have a small problem, when the effect is bypassed I hear a high frequency noise, which pitch changes when turning the Drive pot. It disappears when drive is below 50%. Any idea how to fix that? Thanks a lot, great blog BTW. Built it and sounds great. Preferred the TL072 over the 4558. Seems a bit more defined although hard to tell without taking recordings of both. Heres a pic for the collection. Eternity is the horrific glitter one haha. Pink/Purple Fuzz at the back and Hearthrob at the front. Cheers for the hard work folks. Thanks for posting this! Just one quick question - I was wondering why you speced a linear pot for the volume pot. Is that what the original pedal uses? Does it work better for some reason? Or some other reason? Thanks! The taper of the pot affects the way we hear the sound come through, because the taper is the resistance changes with respect to the shaft. There's a great article over on beavis on how pots work, as well as other passive components. Check it out. @johns - thanks for the reply. From the link you posted: "Volume controls typically use an audio taper because it is designed to change the resistance on a curve that is “smoothed out” given how our brains interpret changes in volume." That's why I expected the volume pot to be log taper, like most other simple volume controls that are simply voltage dividers on the output. 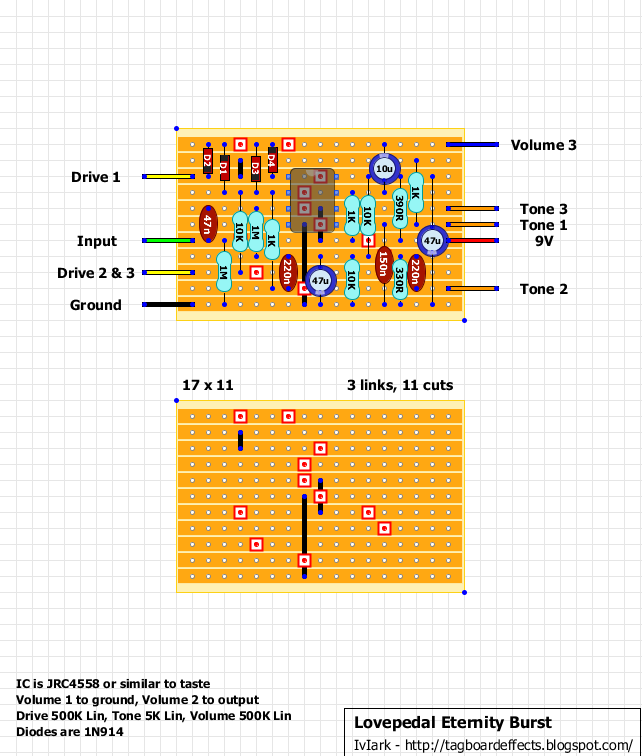 I found a few other people draw up schematics and layouts for this pedal, and they call for a log taper. I think I'm just going for that unless someone built this and says linear works better on this pedal for some reason. Did you try a log pot for the volume ? I'm about to try. A lin increases the volume too fast for me at the beginning. Would upping or lowering the value of the tone pot change the frequencies it sweeps between? Mine is far too bright, so most of the sweep is totally unusable. Any help is appreciated! Hi, my pedal working good but is normal the noise hum when start roll the gain up? Post some IC voltages and hi res pics of the top/bottom and all off board wiring. We may spot an error with fresh eyes. Maybe this is the wrong place to ask, but dows anyone know what the difference between the burst and e6 versions of the eternity is? Does anyone have a schematic for the Roadhouse variant? Hi, I ordered a kit for this from bitsbox. They sent me 470K and 4.7K pots instead of the 500K and 5K. I know that's like a 6% difference (which is well within the usual tolerance of pots) but I'm still wondering if it affects anything (like about trebles that come through, etc). How would I go about adding a clipping switch that has LED, none and symmetrical options? How to increase bass in this thing?